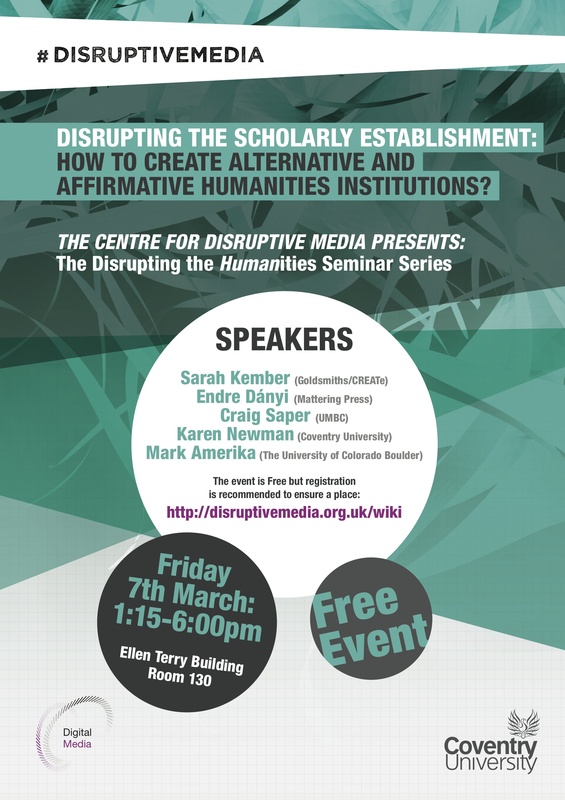 In this series of events the Centre for Disruptive Media critically explored the heritage that accompanies the present-day Humanities, whilst reflecting on a possible ‘open’, alternative and affirmative future Humanities that questions its own humanist legacy. This future does not necessarily need to be a distancing of the present humanities, where its history already provides the seed for a radical self-critique, where an inherent post-humanities has, as can be argued, always already been a part of its proclaimed ‘otherness’. In this sense a posthumanities should then be envisioned as ‘more of a mutation or intensification of elements, dynamics and potentials already present in the humanities’ (Gary Hall).